As the 2018 Academy Awards approach, the YouTube community has been home to tens of thousands of review videos, reaction videos, and discussions of the awards. Ahead of the ceremony on March 4, we examined some of the trends when it comes to nominees. War film “Dunkirk” took first place, with nearly 44 million views globally for its trailer. In second and third place were “Get Out” and “The Shape of Water,” with 30 million and 18 million views, respectively. In addition to trailers, YouTube is home to tens of thousands of review and reaction videos from creators. By examining the words used by creators in such videos, we can better understand how they responded to each film and the effect it left on the community. To do this, we analyzed the captions created by the creators, the YouTube community, and automatic captioning from every English-language review/reaction video about the Best Picture nominees. The Most “I Cried” Film: “Call Me By Your Name.” Coming-of-age drama “Call Me By Your Name” takes the trophy for most review/reaction videos with the word “cry,” a signal that the YouTube community was quite moved by the film. 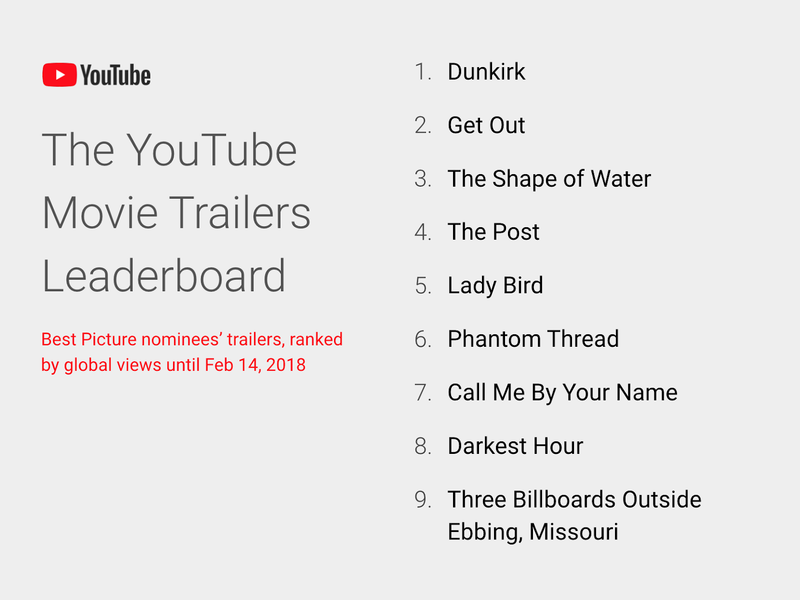 Most “Funny” Film: “Three Billboards Outside Ebbing, Missouri.” About 50 percent of review/reaction videos use the word “funny” for “Three Billboards Outside Ebbing, Missouri,” the most of any Best Picture nominee. Most “Relatable” Film: “Lady Bird.” “Lady Bird” resonated with YouTube creators for its realism. About 20 percent of review/reaction videos used the word “relatable” for the film. YouTube creators also used the word “realistic” in 18 percent of videos. We also used the reaction and review videos to create a list of “top words” used to describe each film. 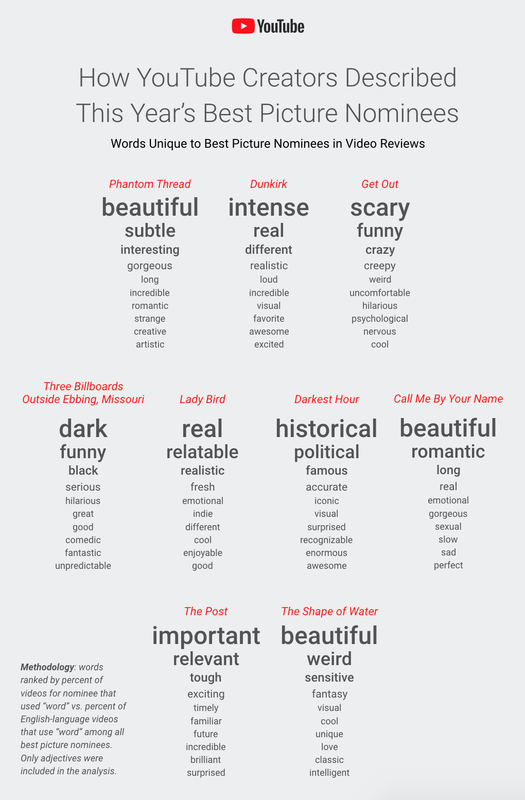 These words were disproportionately unique each Best Picture nominee. Lastly, we observed people coming to YouTube to rewatch some of their favorite Oscar acceptance speeches. Here’s a list of the most-watched speeches to date on the Oscars channel, using lifetime global views. The most-viewed video is from Leonardo DiCaprio, with over 11 million views. The award ceremony begins this Sunday, and if it’s anything like last year, we expect thousands of creators to live react, review, and discuss the winners (or snubs). As summer blockbuster season concludes, we wondered: what older hit films are still being watched in 2017? Did the reboots of the summer renew interest in the originals? What timeless films are younger generations discovering, given the endless viewing opportunities available with streaming? To find out, we combined 12 months of trailer views for every film released between 1980 and 1999. What was the most popular trailer among films released before 2000? The honor goes to “Titanic” (1997), now over 20 years old. Not all trailers on the list were box office smashes, with sleeper hits like “Trainspotting” landing in the top 10. Its present-day trailer ranking suggests that its audience, in 2017, is far greater than when it was released over 20 years ago. The top film from the 1980s: “Ghostbusters” (1984), which likely benefited from its reboot in 2016. The original was averaging 70,000 views/month in 2015, but after the new release, its views more than quadrupled to over 300,000 views/month. The remaining top 10 trailers from the 1980s include “The Little Mermaid,” “The Shining,” and two installments from the “Star Wars” series. Cult classic “My Neighbor Totoro,” a Japanese animated fantasy film, has emerged as a huge present-day hit at #5 among films from the 1980s. “The Evil Dead,” similarly, was the 121st highest-grossing film of 1983, but is now has the #7 most-viewed trailer for the entire 1980s. As both films were never box office successes, few could have predicted that they would now appear in the top 10 for an entire decade of movies. Their present-day popularity, 30 years after their initial release, is a testament to their longevity with future generations and their timeless appeal. In 20 years, what film trailers will be popular from the 2000s? Will it be “Avatar,” with the highest box office for the decade? Or will it be a underground film? We’ll check-in with YouTube trailer views in 2030. On Sunday, August 27, Taylor Swift dropped the video for “Look What You Made Me Do,” the first single off her forthcoming album "Reputation." The video had built significant buzz leading up to its release at the MTV VMAs, fueled by a record-breaking lyric video for the song (the most viewed lyric video in 24 hours), released on August 24, and a preview clip posted by Taylor herself. The result: it had the biggest debut of any video in YouTube history, earning 43.2 million views in 24 hours. After the video’s release, views surged to over 3 million per hour. It would surpass the previous 24-hour record holder, PSY’s “Gentleman,” with five hours to spare. In 2013, “Gentleman” gained approximately 36 million views in its first 24 hours. It was such an impressive milestone that the record stood for over four years. 2017 has been a breakthrough year for record-breaking (and making) on YouTube: this month, “Despacito” by Luis Fonsi ft. Daddy Yankee became the first video to achieve 3 billion views. Will Taylor Swift’s “Look What You Made Me Do” follow a similar trajectory? 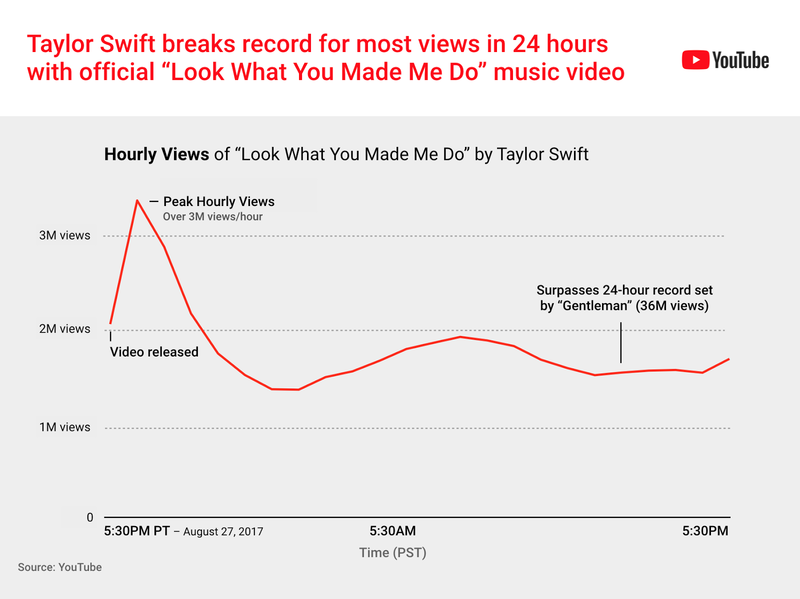 We’ll have to wait and see: to break the record for fastest video to 100 million views, it will have to surpass “Gentleman” again, which achieved the milestone in a mere four days. To become the fastest video to reach 1 billion views, it will have to surpass “Hello” by Adele, which achieved the feat in 87 days. One of the biggest social media moments of 2017, Monday’s solar eclipse, which was visible throughout North America, also became a top moment for video and one of the largest livestreamed events ever on YouTube. From news organizations to educational institutions, a multitude of channels livestreamed the eclipse on YouTube. 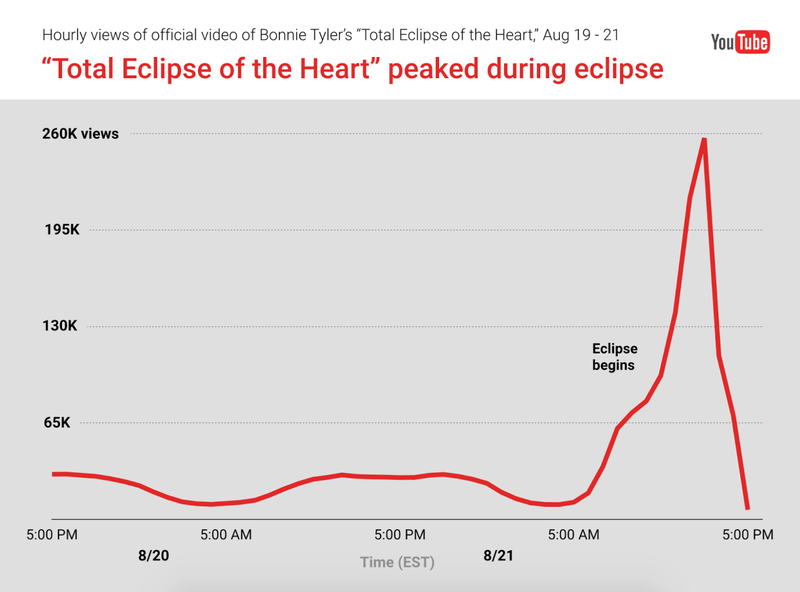 By 10:20 a.m. PT on Monday, more than 2 million viewers were simultaneously tuned in to these livestreams, including NASA’s, which was the most-watched. 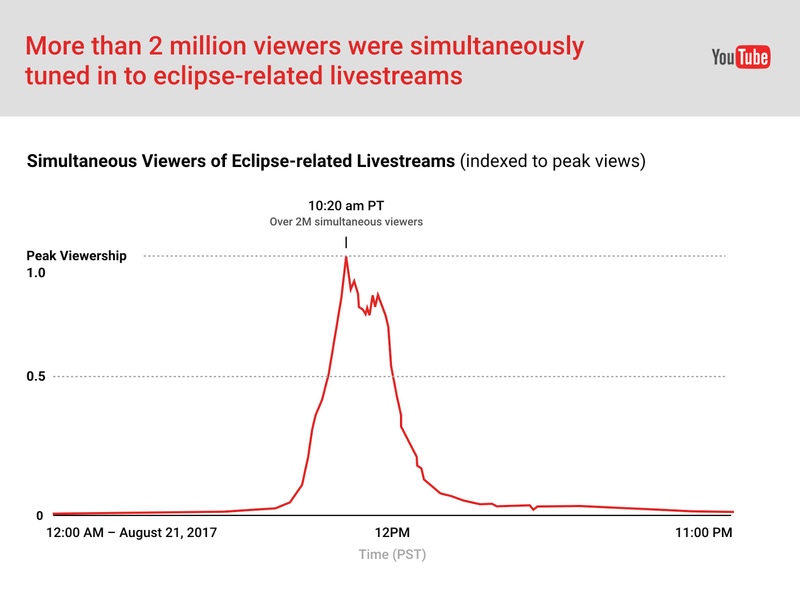 In all, viewers watched livestreams and videos about the eclipse over 100 million times and for 6 million hours since Monday morning. Some people recorded their own time-lapses, 360 videos, and personal vlogs of the experience, and instructional videos on eclipse viewing were a favorite as well, like ”How to Make a Pinhole Projector to View the Solar Eclipse” (1.8 million views Monday) and ”Make a solar eclipse viewer at home with a cereal box” (580,000 views). If you didn't get to see the eclipse (or couldn't get your hands on some eclipse glasses), you can watch plenty of replays like these.